Pre-K is a wonderful time to teach children the truths found in the Bible, and instill God's unconditional love in them! We teach from a biblical wordview so that children develop secure in the knowledge that God is the author of Creation and that He is the source of love, grace, and truth. 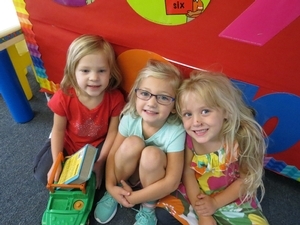 Our Pre-Kindergarten program is a bridge between preschool and Kindergarten. It helps meet the needs of children who aren't quite ready for Kindergarten, but who have gone through preschool. We have developed our own, unique curriculum for our Pre-K class. We build and expand on what preschoolers learn, and expose children to a variety of activities that help them master social and academic skills needed for Kindergarten. Our reading readiness program includes a strong phonics component from Jolly Phonics. Other important pre-reading skills include developing a love for discovering and learning new things; delighting in stories, being read to, and looking at pictures; vocabulary expansion; and developing eye-hand coordination. In addition, our burgeoning readers spend time predicting and anticipating..."What do you think will happen next?" "What would happen if...?" Sequencing is also a developing skill..."First this happens, then...". Pre-K also emphasizes math skills, and presents various units in social studies and science. Students take classes in music, technology, and gym. Pre-K meets Monday through Friday, 8:15 a.m. to 11:15 a.m., with several options for extended care, all beginning at 11:15, when Pre-K dismisses. Extended child care for Pre-K students.